With Easter looming just around the corner and following closely behind that it is time to share some of the things going on in our art room so far this term. One of the big things has been producing three sculptures that have been entered into our local council run "Melville City Sculpture Walk". The work we submitted had to relate to the site where the exhibition is being held. 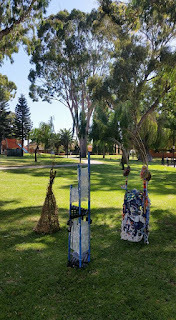 This year it is at Heathcote Cultural Precinct. Heathcote used to be a Mental Hospital until some years ago when it became a playground, cafe, restaurant, TAFE, art gallery and studio site. The whole area is somewhat swish and the views from the site on the overlooking the river is beautiful. But long before this the local aboriginal people used the site. Our sculptures represent the way the land has been used has changed over time and will in all likelihood change again in the future. As we made these structures we also talked about how the aboriginal people would have used natural materials to make their houses, as the early settlers would have done. Over time the materials we used to make our building with has changed - modern houses are made of things that don't break down easily like concrete, metal and plastics. We also reflected on how some people are beginning to think of ways to make buildings more sustainable and we tried to show this with the types of materials we used in our structures. The children worked in small groups with Stella Onderwater who was allocated to our school as an artist mentor, and Karen, one of our parents and myself. The children came up with solutions to building each structure and ways of weaving different materials into each one. Each group reflected on improvements needed from the work of the groups before them. The metal, 'manmade' non sustainable structure proved to be most challenging. There was a lot of discussion about the best, strongest shape required for building. Finally as you can see we figured it out and we have three amazing structures installed in the park alongside professional adult artists work. If you get a chance get along to Heathcote, enjoy a stroll around the park enjoying the beautiful grounds and the fantastic art work. The event runs until Sunday 3rd April.